One of my other favorite borrowed traditions is lighting a yahrzeit candle on the anniversary of someone’s death as a way of celebrating their life and symbolizing lighting their way to peaceful afterlife. October often feels like one long yahrzeit candle lighting, the single flame flickering on the kitchen counter or the dining room table for those people I loved who are gone. Candle lighting to memorialize most of them has been easy, even a natural part of my grieving for them, but a few years ago, I added a new candle to this time of reflection—one that, as a child, I would never have imagined lighting. On Tuesday, I will light a memorial candle for the brother with whom I grew up. Michael was dead for ten years before I touched a match to a memorial candle for him. I don’t know if anyone else in our family marks this day. If they do, no one has mentioned it. Grief can be a complicated thing, and it doesn’t always encompass what others might think. I don’t know that I can say honestly that I grieve Michael’s death. I am certain now, though, that I grieve what his life must have been, what I know his life was during the time when I knew him. In writing Urban Tidepool, I try very hard not to try to tell anyone else’s story. The reader sees Michael (I hope) as I saw him when we were kids—4 years older, bigger, stronger, and progressively unstable. He was a tormented soul who seemed to enjoy hurting other people and hurting animals and on very special occasions, hurting animals in front of other people so he got a two-fer out of the situation. I couldn’t stop then to think about what drove him. All I knew to do then was to protect the dog, ice the bruises and hope that the patches didn’t show where my hair had been ripped out. The ability to see him as something other than that, as something more, as a spiritual being in need didn’t come until decades later, when Michael and Philadelphia were far behind me. Every year, approaching this date, I have to wonder. Are we capable of grieving the loss of people who have hurt us deeply? What do I grieve? What can I grieve? The answers have been hard won so far. What drove him to do those things, to be those things, is exactly what needs to be grieved. I’m not actively writing Urban Tidepool right now and I have come to understand what is probably just a fraction of his story. 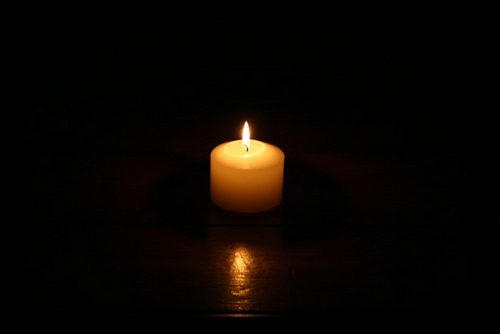 So on Tuesday, I will light a candle for an eleven year old boy whose mom just died; whose father’s best sober idea of nurturing a future man was to insist on resolute stoicism and best drunk idea on nurturing a future man was to beat him with bare-knuckled fists until blood appeared under the pretense of teaching him to defend himself; whose significant mental health needs went unacknowledged; whose probable learning disability was never diagnosed because we didn’t look for those things in Catholic schools in the 1970s; whose drug use was ignored until what went down his throat, up his nose and into his arm consumed his entire life and ultimately ended it. My story aside, I can grieve for that little boy. For him, I will light a candle and hold out the thought for a peaceful afterlife. Your loving, gentle, forgiving heart is an inspiration. On Tuesday, I will light a candle for Michael as well, and celebrate not only his life, but yours, and how your work brings hope and light to so many who desperately need it. Thank you, Nancy. This leaves me speechless, Georgia. I grieve for the little boy AND little girl who lost their mom at a very young age. I grieve for the man Michael never became. I grieve for his tortured soul, and I pray that he is finally at peace, and I am thankful for the greatest gift he ever gave me, our daughter, who turned out to be a beautiful, good, intelligent woman. I know I can never forget, but I think your story will certainly help me and others…….. learn how to grieve and forgive. Thank you, Karen. Remembering does not preclude healing. For all of us. What a powerful post, Nancy! What a depth there is in your tidepool…forgiveness, empathy, and love. I know that siblings in abusive family’s experience things from their own unique perspective, but it seems like the journey you began in writing Urban Tidepool has taken you to a really good place. My own pathway took me away from and then back to my sister, but the breach of trust between us based to a large degree on very different experiences with our parents still needs further healing. I commend you my friend, may the candle you light continue to guide your path. This week, the brother I grew up with has been dead 30 years. I wonder who he might have become. I wonder who we might have become. Praying for the little boy and the little girl. May God Bless You. Thank you, Peggy! And thank you for reading! I am just getting to my many emails…Your story touches my heart as so many of your posts do…or my funny bone. I pause to bring love into my own heart for others who hurt my innocence in life so many years ago. I’m so glad you’re part of the journey, my friend!